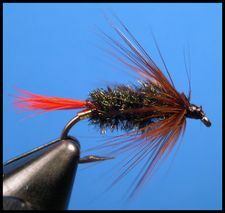 The Brown Hackle Peacock is one of two flies sporting a red tail and peacock body that really excites panfish. The other fly is the Gray Hackle Peacock. To tie the Brown Hackle Peacock use the materials listed above and follow the step-by-step tying instructions for the Gray Hackle Peacock.